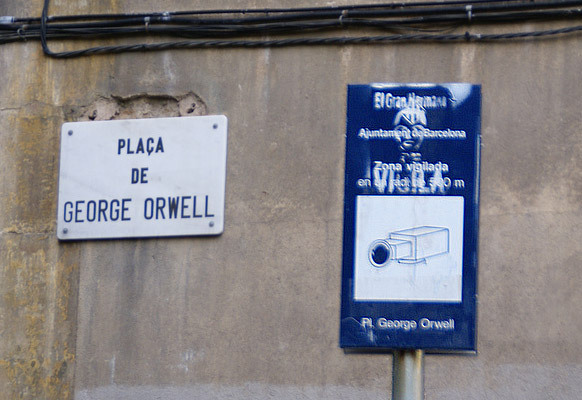 Writer George Orwell, the author of literary classics such as 1984 and Animal Farm, lived in Barcelona between 1936 and 1937, during which time he became a POUM militant fighting on the side of the Republicans during the Spanish Civil War. Eric Arthur Blair (Orwell’s real name) paid his own particular tribute to Barcelona and to the period in history that he lived through with his book Homage to Catalonia. What has the city done for the author in return? Apart from giving his name to a square, until five years ago nobody had ever given a thought to remembering George Orwell. Then the CCCB, upon the proposal of a group of experts on the writer, created Orwell Day, a tribute in the form of a debate and a historical-literary route. Pau Rubio, one of the promoters of this initiative, tells us about it in this article. In George Orwell’s case, the distance that separates history from oblivion is a millimetre. Just one millimetre: the same millimetre by which the bullet that went clean through his neck on the Aragon front missed converting him into an anonymous dead man. Initially, even he himself reached the conclusion that the projectile had killed him, which would have been the most logical outcome. If parallel dimensions exist, it is almost certain that in the great majority of them, that shot was the endpoint for Eric Arthur Blair. They made him disappear down the drain of some secret prison. He was found by the police who went to look for him at the Hotel Continental. The agents inspecting the train in which he fled for the border did opt to ask him for his papers. His name as a “staunch Trotskyist” did arrive at the border control list in time. In such a way that in any other parallel present, nobody has ever heard of a certain George Orwell. There are so many ways in which this English writer might not have gone down in history, that there is only one way of explaining the fact that it happened: it was meant to be. His is such an improbable biography that one could imagine that of all the worlds possible, we live in the only one in which it occurred in this way. In any other world, Orwell didn’t survive the war. Or he didn’t get involved with the POUM militia. Or he simply did not obtain leave from work right on the dates that allowed him to become a witness to the events of May in Barcelona. In consequence, he never came to pay Homage to Catalonia. And, of course, nowhere does anyone pay any homage to him. Fortunately – and despite the fact that in so many other circumstances we desire the opposite – our world is not any other world. It is this one. And here, George Orwell continues attracting new readers, despite the years that have elapsed since his death. His eye-witness account of the Spanish Civil War has turned out to be fundamental in ensuring that among the defeated, the victors could not impose their view. His extraordinary clear-sightedness in the reading of his own times continues providing keys to understanding our own. His work continues to grace bookshelves and bedside tables. It continues to filter into conversations. Against all odds, Orwell, that lanky chap who came to Barcelona to defend freedom and tell the story to the world, remains among us. What Orwell felt for Catalonia was a love not totally requited. He proclaimed it to the four winds from the cover and the spine of one of his capital works. He maintained it faithfully until his death and with it, he contributed towards building the universal brand that is Barcelona today. Still today, a large number of visitors visit the city following in his footsteps. And in exchange, what has Barcelona given to him? British journalist Nigel Richardson could not get over his surprise when, in the year 2013, he arrived in Barcelona to prepare a report to coincide with the 75th anniversary of the publication of Homage to Catalonia. The only place to remember the author was a square which surveillance cameras have made truly Orwellian, but which nobody refers to by its official name, using another that is rather more lysergic. Moreover, nobody in the city seemed to be aware of the occasion. There were no events programmed, nor did any glimmer of hope exist that any institution had the slightest intention of vindicating Orwell. Following the meeting with Richardson, two of us who took part in his report felt something akin to shame. How was it possible that Catalonia, and Barcelona in particular, had side-lined to such a great extent a figure which they should have appropriated? It made no sense that in a city of such cultural splendour there would not even be a simple tribute paid to the author of Nineteen Eighty-Four and Animal Farm. It was necessary for somebody to do something about it. But who? Eventually, given the lack of official recognitions, we decided to organise an officious one. Perhaps we were not the most suitable candidates, but at that moment in time we were the only ones. The circle of experts to whom we explained the idea embraced it enthusiastically and offered to collaborate. The CCCB opened its doors to the initiative and in that same year of 2013, there was a first Orwell Day. Its initial formula has been maintained each year since then: free routes around the sites of Homage to Catalonia on the Ramblas, and a conference and an entire day devoted to the writer on the social media networks. With the exception of the first year, which was more of the nature of a pilot test, the response from the public has been excellent. The literary routes, despite having increased in number, have filled all their places year after year. And the central event at the CCCB, which has not depended on speakers known by the general public, has seen a massive affluence of people at all the editions, proof of the fact that the city was hungry for Orwell. In this way, and despite the voluntary or negligent forgetfulness on the part of the institutions, Catalonia and Barcelona have finally repaid the homage to Orwell. Let’s hope that Orwell Day #DíaOrwell keeps alive for many years the memory of this improbable author who knew how to find his own truth among that of others. Not only is he still relevant and greatly needed, but also, this is perhaps the only dimension in which he exists. Pau Rubio (@pauinthecloud) is one of the promoters of Orwell Day #DíaOrwell.